Dealing with the fallout after one of your colleagues kills an unarmed person in the line of duty is awfully stressful work. The NYPD knows this better than most. So it only made sense that after protests engulfed Baltimore in the wake of Freddie Gray’s death, New York’s finest were there to lend a sympathetic ear to the city’s police. The Police Organization Providing Peer Assistance (that’s POPPA to you), a nonprofit that provides mental health support to police officers, sent a group of active and retired NYPD cops to Baltimore to counsel BPD officers earlier this month, the New York Post reports. “They’re under a lot of stress down there,” John Petrullo, the Manhattan-based nonprofit’s executive director and a retired cop from the 63rd Precinct in Brooklyn, told The Post.“Our main concern was their well-being while they’re enduring this. They do a super-tough job and now the citizens turned against them and they have people throwing rocks and bricks at them,” he said. The cops threw rocks too, for the record. POPPA offered its support to Baltimore police, according to the Post, because “For nearly two weeks after Freddie Gray’s death on April 19, the city was under siege by violent protesters who looted businesses, torched police cruisers and assaulted Baltimore’s Finest.” Anyone who was in Baltimore in April could tell you that this assertion is baldly false. There was violence, yes, and some of it was quite serious. But if anyone was besieging Baltimore post-Freddie Gray, it was the police who snatched nonviolent curfew violators into Hummers and national guardsmen who patrolled protests—the vast majority of which were peaceful—with military rifles. POPPA visiting Baltimore is a good thing. All police should have good access to counseling! And opportunities for exercise, like NYPD does thanks to its brand-new Zumba studio. A happy, self-actualized cop is a cop who is better at his job—and who is less likely to go WWE on a citizen who doesn’t put his hands behind his back quickly enough, or get scared and pull the trigger when he encounters a black man with his hood up. But the residents of Baltimore’s poor neighborhoods have dealt with far worse than rocks thrown at them, and for far longer than a few weeks. Freddie Gray is dead. Tyrone West is too. If Baltimore cops need a mental health break, the rest of Baltimore needs one worse. 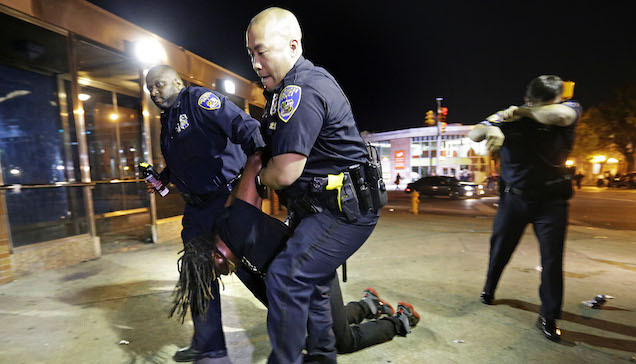 Photo of Baltimore police carrying a pepper-sprayed man after curfew via AP. Contact the author at andy@gawker.com.